so, ok, we continue on without dealing with oils. oils were important money for me btw, so my carefully hoarded 60 demonstones was from like 2 yrs of collecting and my like 40 white orbs which I didn't burn in HM+CS because I was TOLD TO SAVE THEM. This is the crux: WE WERE TOLD TO DO SOMETHING AND GOT SCREWED FOR LISTENING. the fair thing would be to give me 60 oils worth of whatever replaces demon stones. also I have only spent maybe $850 on this game, so I can easily cut and run. NO MO MONEY FOR YOU UNTIL I GET MY 60 DEMONSTONE REPLACEMENTS SO I CAN CONTINUE FARMING THE OTHER OIL MATS. I lost lots of them now. 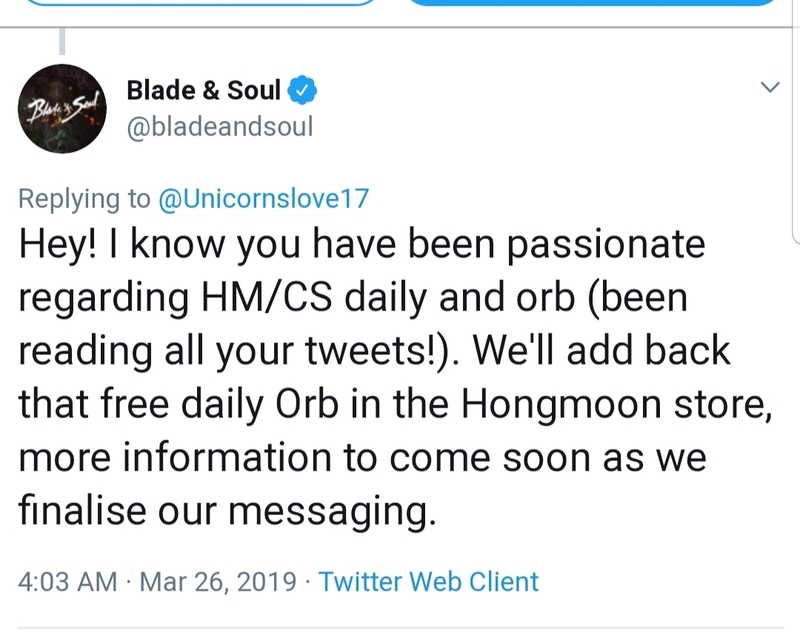 Good Job for the misscommunication between staffs of NCSoft. Dear NC (none care) Soft, this is it my premium is going to run out without renewal and hey i am going to spend my Trove money on Warframe good riddance. Aren't you amazed how there is no peep about this from None Care Soft anymore? The think if they play ostrich we will forgot this "cricket* of *cricket* they pulled off. I want my stuff to be exchanged or ill just boycott the game and stop paying for my part. Sadly i am no lawyer, i wished that a lawyer who plays this would say something to this whole thing. NCSOft is another game developer that has killed my desire to play their game. Taking all the demon spirits I had to make my sacred oils without replacing them with an equivalent material and amount to continue the same way was stupid and a total rip off. Also, the replacement of White Orbs that was cost between 4-6 gold for the Ascension Orb fragments that each is now costing more, makes the event stupid as the rewards for the loot are not really worth that much. Of course I am assuming the party members will leave the loot for the dude who uses the orb. NC is a total disappointment and I am not sure what their goal is by upsetting the community this way. That is the spirit of a poor customer service and lack of vision. NC failed horribly up and they expect the players to pay the price as they refuse to fix it. NC is a total JOKE!!! no wonder people left their team already. Well very limited to the point of no existing. In the Term of service it says they are not oblige by any means to : respond or comment on forums, compensate in any way or form for bugs and glitches in the game, repair bugs and glitches, they can terminate your account not giving you a reason and so on. At this point I will urge everyone to read trough it as it is more interesting than doing undoable event. At this point I will urge everyone to read trough it as it is more interesting than doing undoable event. Also, what happened to the OTHER thread about this that was also pinned? "cleaning up"? You probably get rights for CS/Heaven's Mandate resets because it costed real money but that's it. 1 free orb again are you kidding. I wanted to craft lots of oils...now it is impossible. Lost money on items that where salvaged. Giving a free orb is just a big insult. And still missing demon spirit stone fix! already 1 maint and no fix? "This is unfortunately by design and will not be changing. Due to testing complications for these items on our internal servers, and a miscommunication with the development team..."
They might forget it, but that doesn't mean we'll just let it go. I have thousands of gold lost in this. Not abandoning it. Event is ending and still no word? Cyan, what happened to engaging with the community? Engaging with radio silence? Next week is the new event right? So they should be streaming soon.